Pantai Sentral Park organised its own celebration to welcome the Year of The Rooster by bring more people together. Open to property owners and the public, the fun day at the ICE Gallery saw crowds of families and young adults join in the festivities to end the Chinese New Year mood with a bang. 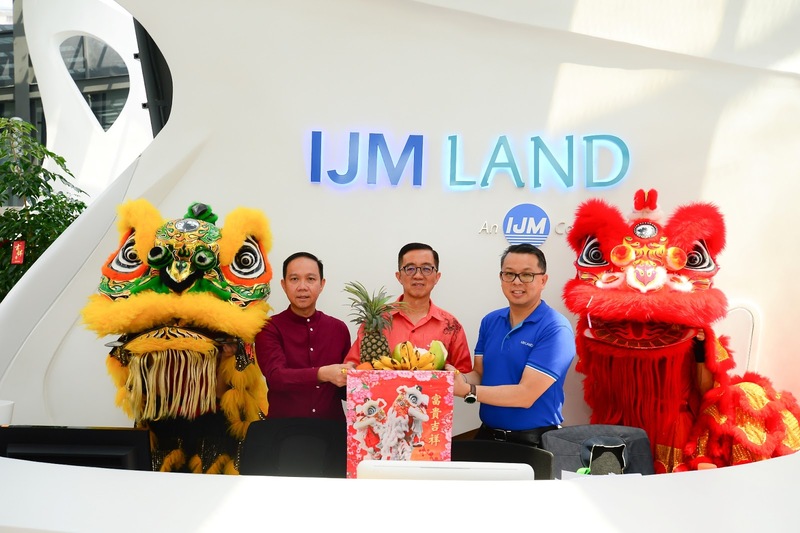 Edward Chong, Managing Director of IJM Land Berhad, Dato Hoo Kim See, Senior General Manager of IJM Land Central Region and Grace Foo, Sales & Marketing Manager of Pantai Sentral Park,taking part in the Yee Sang tossing tradition, announcing auspicious wishes for a brand new year. Visitors to the event also had the chance to witness a vibrant Lion Dance performance by Kun Seng Keng Lion & Dragon Dance Association Muar, the winner of the 2016 World Lion Dance Championship. Children were taken in by the Rooster mascot, who delighted his fans on his walkabout around the showroom. The young at heart also tried their hand at Rooster Clay making and Chinese Hand Fan painting. Visitors also witnessed the God of Wealth at the venue, adding to the Chinese New Year vibe. The event also saw lucky draws and angpao giveaways for lucky visitors at the ICE Gallery. Visitors at the event took time out from entertaining activities to enjoy the array of food available at the showroom, including lunch, herbal eggs, cotton candy and dragon beard candy. Tea lovers were given the chance to appreciate the finer details of Chinese tea, through tea appreciation demonstrations. Among the highlight of the Red Rooster celebration was the Tea Leaf Reading or tasseography, an ancient Chinese practice of reading tea leaves. Perfect for the start of the New Year, the crowds lined up to get advice on life, given by the tea leaf consultant based on remnant tea leaves. A visionary development, IJM Land’s Pantai Sentral Park, is poised to be a township that brings people together to live, work and play. With 7 residential phases and 6 commercial phases planned for the one stop urban forest city, Pantai Sentral Park offers investors the opportunity to gain huge returns with the upcoming PSP Interchange, which provides direct access to the NPE Highway. Future residents of Pantai Sentral Park will be living their dreams in the heart of the new Golden Triangle that connects Kuala Lumpur, Bangsar and Petaling Jaya. Pantai Sentral Park is also located at the doorstep of the burgeoning MSC Malaysia Cybercentre at Bangsar South. The developer’s 58-acre avant-garde township, to be completed within 10 to 15 years is the ideal combination of a nature inspired lifestyle and modern day amenities, with a seamless integration of residential, commercial and recreational touch-points. to the fullest,” said Grace Foo, Sales & Marketing Manager of Pantai Sentral Park.